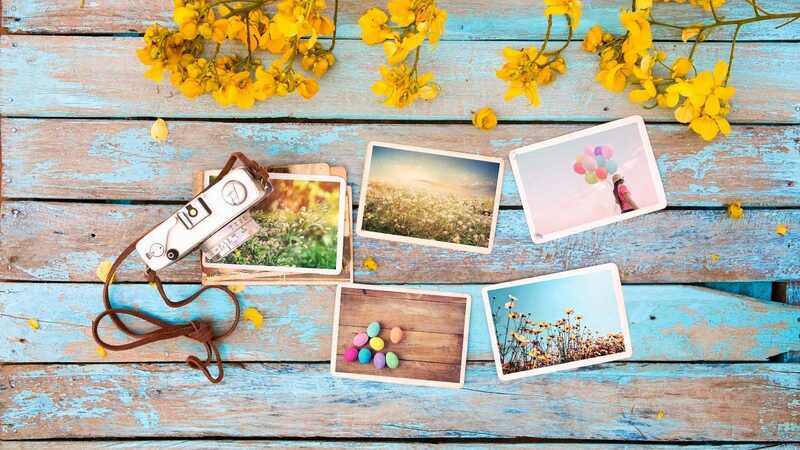 Ultra portable photo printers are great for when convenience and speed is key to printing your photos, but how about if you want a better quality image? We’ve taken a look at the best desktop photo printers. In the past, we’ve checked out the ultra portable options out there. Typically lightweight, reliant on battery power, and quick if not entirely stunning looking, they serve a great purpose when you’re out and about. This time round, we’re checking out desktop photo printers. You won’t want to move these far from your office space, but they’re ideal for when you want a near photo shop level of quality at home—just be prepared to pay for the pleasure. Here’s our top picks. Weighing in at 43lb, the Canon Pixma Pro-100 is a heavyweight choice in more ways than one. It offers 8 dye based inks so your photos reflect the wondrous colors and gradients of the world, with 3 dedicated grayscale inks for black and white imagery. There’s an Optimum Image Generating System that promises to reproduce colors accurately, with a resolution of 4800×2400 dpi. 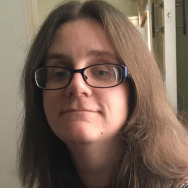 The printer will also print shots up to 13″ x 19″ so it’s good for all manners of uses. Software wise, it’s possible to print directly from a compatible digital camera, camcorder, or smartphone, with AirPrint making it particularly easy to do so if you use an Apple device. Naturally, you can print directly from your photo suite of choice on the desktop, too. It’s expensive but it’ll handle pretty much anything you throw at it, and it’ll do so with aplomb. Not everyone wants a heavy or bulky printer in their home, even if they’re not planning on moving it around often. Plus, who wants a printer taking up a ton of room? 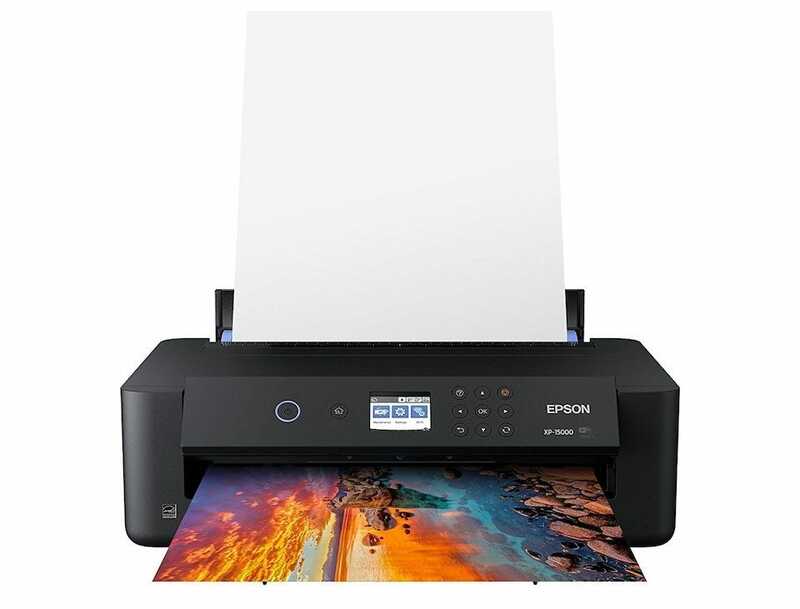 The Epson PictureMate PM-400 is the ideal choice for those that want a powerful photo printer but in a lightweight size. It only weighs 6 lbs but it packs a punch where it counts. 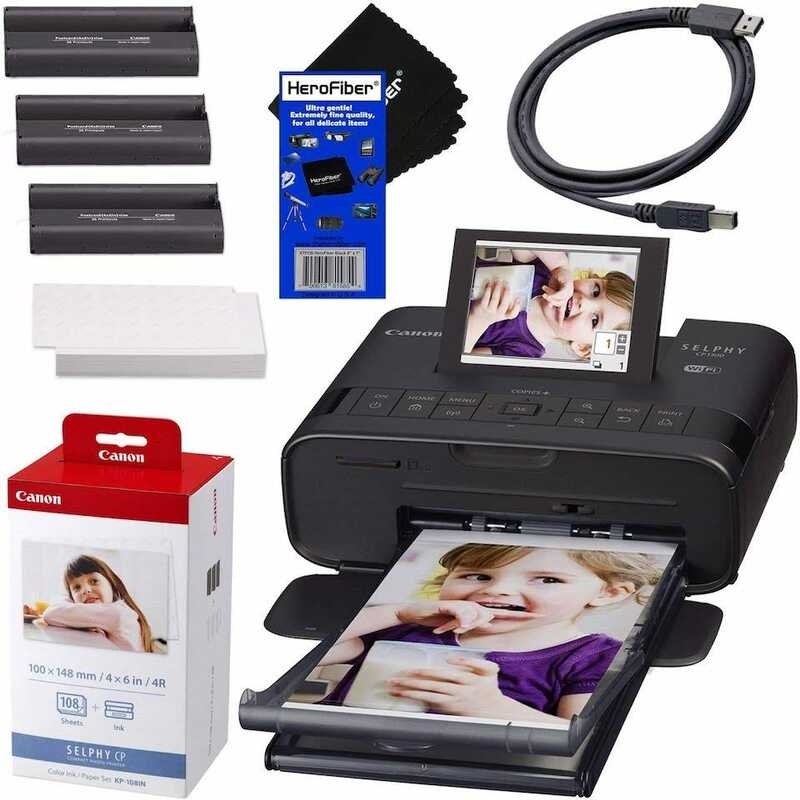 The printer makes it easy to produce 4″ x 6″ borderless photos with a print time of only 36 seconds. A 2.7 inch color display makes it easy to preview your photos, or you can print directly from your tablet or smartphone. Use the appropriate ink and paper, and Epson promises that photos are smudge, scratch, water and fade resistant, and will last up to 200 years safely. Such durability reinforces just how convenient this printer is. If you’re planning on printing many images fast and want a small footprint in your office, this is an ideal printer for you. If you’re on a budget, you don’t have to miss out on good photo quality. The HP Envy 5055 will fulfil most photo printing needs at a relatively low price. It’s essentially a fancy regular printer but it supports sizes up to 8″ x 10″ which should be sufficient for most people. There’s Bluetooth and Wi-Fi support, as well as the option to print via your social media accounts or iCloud, Google Drive and Dropbox accounts. A 2.2″ mono touchscreen helps you see what’s going on, with automatic two-sided printing for regular print outs. There’s also Amazon Alexa support (which, as you’d imagine, is a bit limited in utility when it comes to photo printing). Photo quality won’t be on a par with the more expensive options here, but it’s certainly better than using a regular desktop office printer to produce your favorite snaps. Sometimes, you may want to print out an image that pops both in size and color intensity. 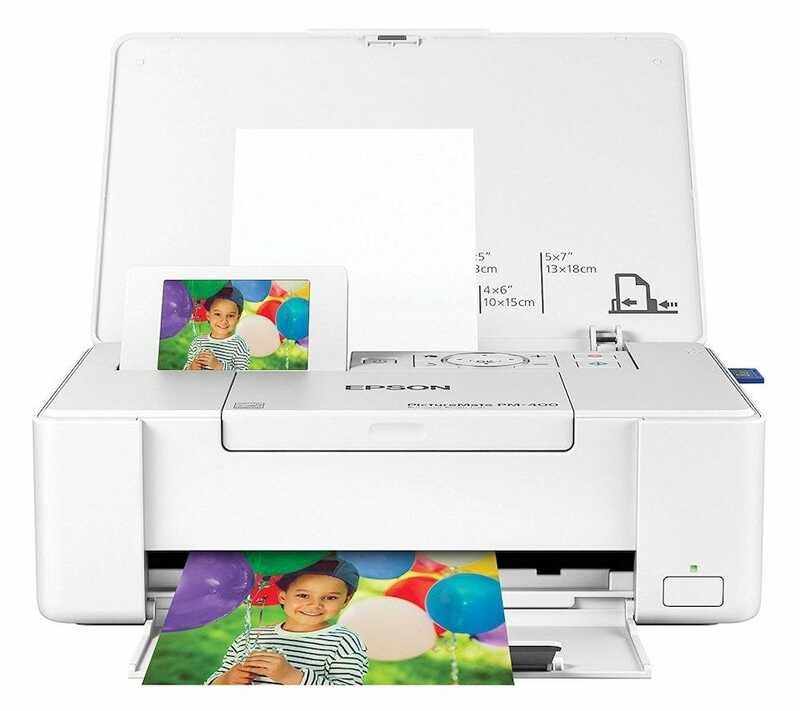 The Epson Expression Photo HD makes it simple to print out images sized up to 13″ x 19″. If you’re keen on photographing beautiful panoramas, this is the printer for you. It’s produced via individual 6-color Claria Photo HD ink which basically means an ultra wide color gamut, as well as enhanced black and white prints too. With a keen eye on making professional projects simple, there’s a 50 sheet rear tray designed for speciality media, including cardstock, and it has options for a variety of different paper finishes. Despite being a chunky A3 printer, it’s smaller than most so it’ll still fit on your desktop. For added convenience, there’s Amazon Dash Replenishment so you can easily re-order new ink as and when needed. There’s a 2.4″ touchscreen too. It’s an all round convenient package. Want a complete package to get you started on your path to photo printing? The Canon Selphy CP1300 is the package for you, and it has a few tricks up its sleeve. The package comes with a Canon Color Ink Paper Set that produces up to 108 4″ x 6″ prints, as well as a cleaning cloth. Where it stands out a little more is the speed in which the printer can complete your images. That’s thanks to its Dye-Sub technology which provides instantly dry images, that promise to last for up to 100 years. Elsewhere, there’s the usual bevy of useful features. You can print from memory card or USB stick, through Wi-Fi or AirPrint, and a 3.2″ LCD screen keeps you constantly informed. Various print sizes from stickers to 4″ x 6″ are catered for here too. If you just want fast snap shot size photos with no fuss at all, it’s very tough to beat the SELPHY’s no-ink system and ease of use. Many people rely on an invigorating shower to start their day… but you might be let down by that 20-year-old shower head. Upgrading to a new one is one of the quickest, easiest, and rental-friendly ways to improve your bathroom. Here are the best choices, depending on your needs.